Virtual Scoring Machine - Tournament Version! NCAA team format. And also, Best 2-of-3 five-touch bouts. Internet connection, so it also has to have a "stand alone mode". Oy. Two Years Later: announcing VSM - Tournament Version! Automatically keeps the score sheet. Automates a 1-minute "no hit" clock for monitoring "non-combativity." 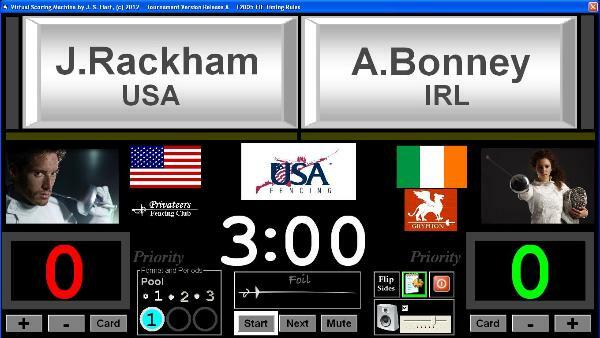 exchange with the new Fencing Time 4.1 Scoring Device Manager. 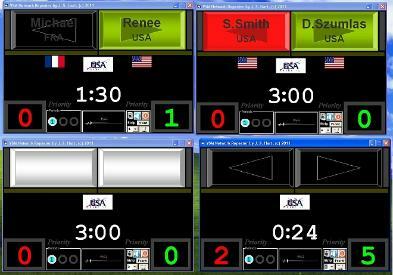 application for remote score sheet display called "Scoreboard". inexpensive, and available from the "Products" page. 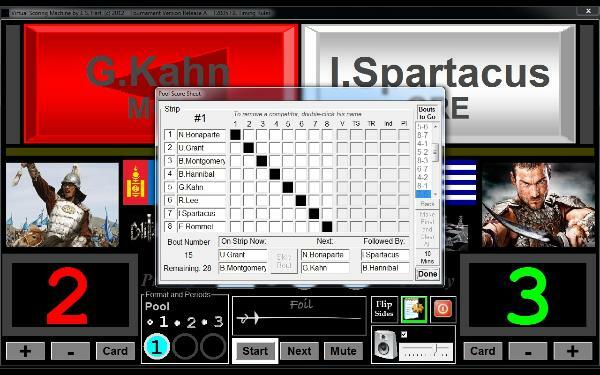 This is a screen shot from one of the included demo files showing the pool score sheet. This is a network-connected repeater display. connected VSMTV strip, and all running on a single computer at the same time.